A sweet-salty snack of King scallops wrapped in prosciutto ham and drenched in a zesty lemon and dill dressing. Skewered and ready for the grill or barbecue. I received the scallops, along with a contribution towards the ingredients, from Farmer's Choice so that I could bring this recipe to you. It's a good one! Scallops are so nutritious. And they're quite important to me, because I have really strong memories of eating my first ever scallops on the Isle of Man. They were quite big, chunky and called Queenies. I remember I wasn't keen on seafood at this time in my life (daft, I know), but one bite of those things and I was hooked. I found out that Farmer's Choice sell the larger King Scallops on their website. They arrive frozen, so you can quickly get them into your freezer and defrost them when needed. Mine defrosted in the fridge overnight - make sure you place them on the bottom shelf of the fridge on a plate, to catch any drips that come through the packaging as they thaw out. My favourite way to eat scallops is just fried a little bit in some butter until caramelised and a bit golden on top - maybe also with some chopped bacon in there until it goes crisp. But I wanted to make something different. 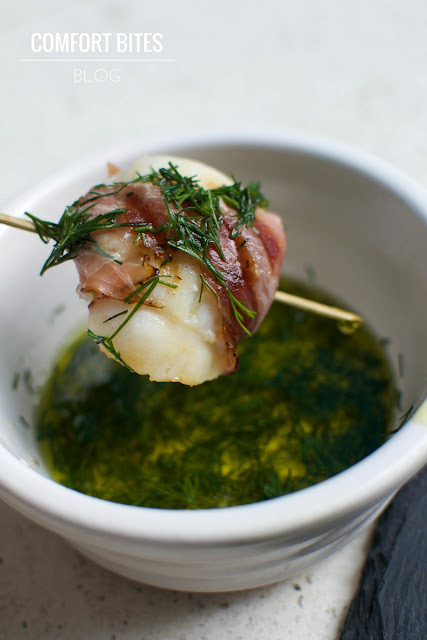 I started to think about the sweet flavour of scallops - which is so different to fish - and couldn't stop thinking about a dill and lemon combo. And of course I needed something salty. Bacon had been done. So what about a good well-marbled, paper-thin Prosciutto? 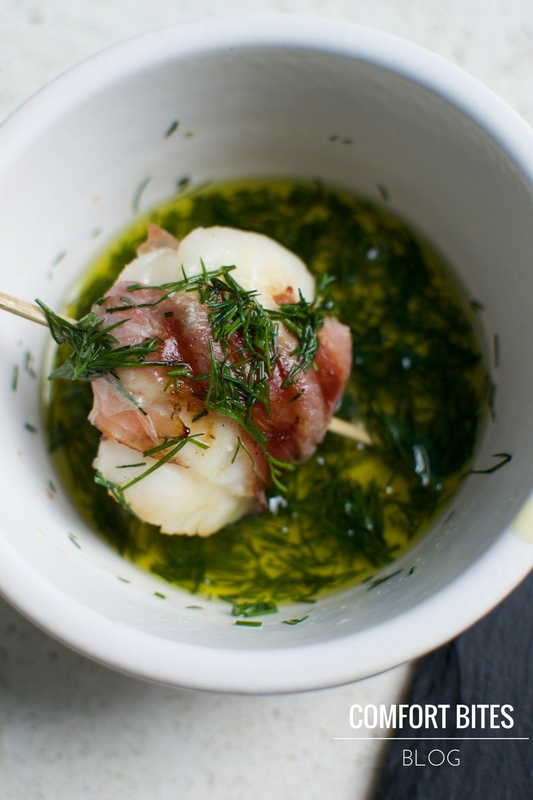 You'll also need a small skewer or cocktail stick for each scallop. Take the scallop and, if you like, remove the orange-coloured coral and the thin membrane that comes with it. If not, leave it on (it feels wasteful to me to chop it off, so I eat it). Cut the slice of Prosciutto ham in half, lengthways, and wrap it around the scallop. 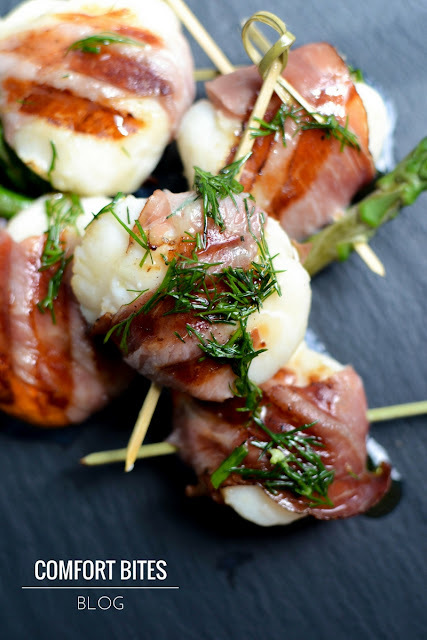 Skewer the wrapped scallop with a cocktail stick or small skewer, and then slide on the asparagus tip. Wash your hands and drizzle with the olive oil and then either grill or BBQ the scallops for about 4 minutes on each side, until cooked through, or you could also cook them in a griddle or frying pan for 3-4 minutes or so per side. While the scallops are cooking, quickly mix together the dill, lemon juice, extra virgin olive oil and the pinch of salt to make the dressing. Once the scallops are cooked (you can cut into one if you want to check - it should be plump and pale all the way through), serve on a board or plate and have the dressing ready for dipping or spooning over, while they're hot. I received the scallops from online butcher Farmer's Choice, who specialise in free range meats and also seafood and fish. I've been cooking with their food for a few years and I always love it. Go check them out!